I think it didn't deserve to be brought into Israel, let alone get a Hebrew dub with such an awesome voice cast. They probably only brought it because the TV Series must've been successful at the time. Honestly I don't think TATMRR even deserves to exist. Harsh maybe? I don't really think so. Why? Because it barely changed the show at all. It added Diesel 10 and Lady is the biggest argument, but Calling All Engines reintroduces them anyway. It's never mentioned again either ("Twinkle Toes" isn't a reference either. It's a phrase.). I disagree. Alcroft took many risks with the TV Series, introducing the original stories in S3 and including the scarier S5 episodes are the most notable. TaTMRR was just another risk that she took, and unfortunately it didn't pay off (being a box office bomb and a critical failure) and the prices were paid for that, but if she took no risks, the show would have finished after Series 3 or 4 as there would have been nothing left to adapt. Why does everyone have to hate this movie?! I seem to be the only one who likes it at all!! I personally think that this is the best thing EVER from Thomas. Diesel10 wrote: Why does everyone have to hate this movie?! I seem to be the only one who likes it at all!! I personally think that this is the best thing EVER from Thomas. I believe that TATMR is a vegemite mix. In other words, some people like it, others don't. I find it a guilty pleasure. That's the reason I always say it isn't bad, but not good either. DonaldDouglasandToby6 wrote: Honestly I don't think TATMRR even deserves to exist. Harsh maybe? I don't really think so. Why? Because it barely changed the show at all. It added Diesel 10 and Lady is the biggest argument, but Calling All Engines reintroduces them anyway. It's never mentioned again either ("Twinkle Toes" isn't a reference either. It's a phrase.). I agree. I think if Britt Allcroft wanted to do a Thomas movie then it should of followed the TV series format. Also the only parts of Season 3 I didn't like were Diesel replacing Daisy in Mavis, No Joke for James, Flying Scotsman and Bear not being introduced and the beginning of The Trouble of Mud. But, come on, isn't there SOMETHING that you like about TATMRR?! Dunno if this is considered common, but when it comes to watching episodes, I always go for the UK/AUS version as I grew up with it. The US version sounds somewhat "wrong" in my opinion (can't explain how it is), but I do understand why they had to Americanize some voices and terms. I do make exceptions however for when the US get content first, such as getting a few episodes of the upcoming season on a DVD. Lucky 'Muricans. Also, back then, I kinda... didn't mind(?) the recent awful seasons. That's because I was too soft - with franchises you love, there is surely something about them you hate. And in that case was just hating those terrible seasons. However, outside of the Thomas franchise, I seem to have a better taste on things that are average or kinda bad, like the TMNT 2014 movie for example. I received some entertainment from that movie. And... I was kinda disappointed when I saw Tale of the Brave. But after having seen The Adventure Begins and that I'll be seeing Legend of the Lost Treasure, it'll definitely make up for that. Me too for most of them. I always watch the UK dub, and I wouldn't even watch new content if it was the US Dub. It took me until S15 to realize how absolutely awful the last decade had been, it just got boring by then. S16 felt excruciating to watch. I was a little disappointed by TotB, it was good but KotR was better. 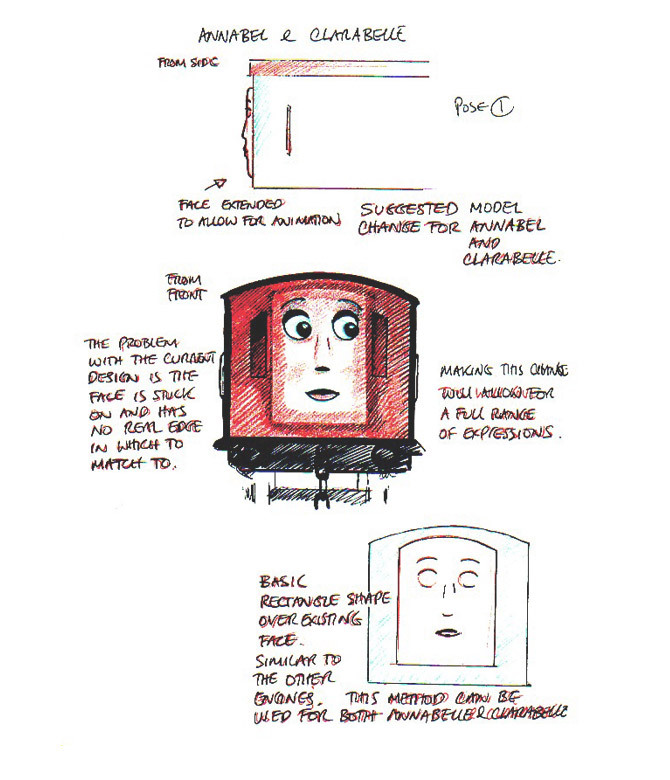 Well...There was that grey faced Annie and Clarabel concept art...I kind of wish they would have used it. I prefer everything the some and I like the grey faces. I have always found characters without the gray face (or without a face at all) strange. So when I draw characters, they always have gray faces: Annie, Clarabel, Harold, D199, Bear, every freight cars/trucks (excluding flatbed/well wagons), all cranes, all cars, all boats, ext. I look at it like this: Their universe all vehicles have faces and talk. I would find it rather irritating if the car I was sentient or not. Second, I like Bash, Dash, and Ferdinand (although there isn't really any character I don't like...for the most part). Misty Island is what I have the issue with. Misty Island shouldn't be uninhabited, it ruins any realism it could have (although my dad would give me a hard time because where is the realism in talking locomotives). Before the special I pictured them as an American Edward, Bill, and Ben. I still see a lot of that in them. They were just in some crumby episodes, tied with an abandoned island, and that stupid catchphrase (I also would like to say "O the indignity" is rather irritating at times). I think if they were brought back I feel they would better written if they keep up the way they have been writing. Not to say I want them back right now. They are doing a great job and I would like to see other things before they did. p.s. NOTE: These are OPINIONS! I know I am in the minority for this but this is the 'unpopular opinions' discussion. Don't worry, this thread is specifically for people who have opinions that feel they are in the minority. I think it's really strange that the Diesel from "Bowled Out" has so many names/titles/nicknames/aliases. laG roiL wrote: I think it's really strange that the Diesel from "Bowled Out" has so many names. Diesel10 wrote: But, come on, isn't there SOMETHING that you like about TATMRR?! The more I think about it, no. I used to like the music, but honestly the songs have nothing to do with the movie. Either that or they don't feel like Thomas; they feel more like some Disney knockoff. I also used to like the comedy, but that hasn't aged the best either. The wit's there, it's just not enough. The sets and models? The sets are lazy interpretations of what Sodor is, and the models are just the ones from the show with added lamps. Both of those aren't really names. Eh, your right they are more like Titles then names, but whatever. I just call him The Diesel like you, but when people get confused, I say Class 40. I just call him "The Bowled Out Diesel" because that was his only official appearance. And if I just called him "The Diesel", people would think I'm referring to Devious Diesel or they wouldn't know which diesel I'm referring to. I like Mavis' old US voice (Jules de Jongh) a lot more than her current one (Teresa Gallagher, who is also her UK voice actress). Out! You must leave this place and never come back!